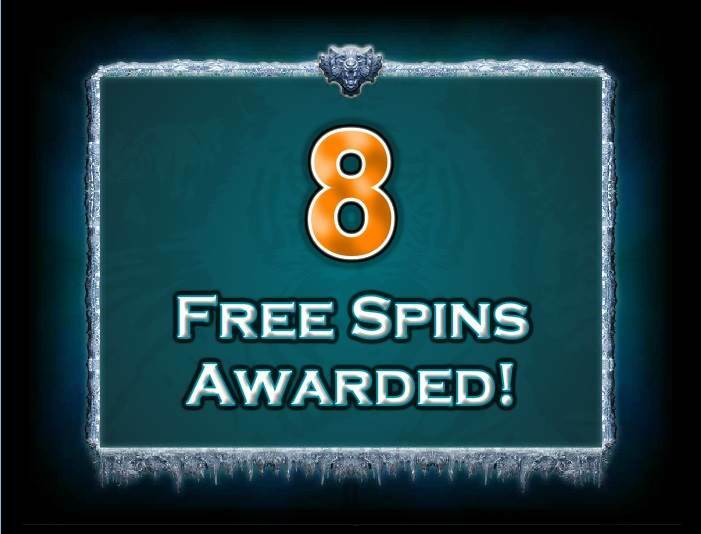 Although it might look frosty, the Siberian Storm slot is filled with massive hot wins! There is no denying that IGT are professionals when it comes to crafting mobile slots that will go on to be played for decades to come. And, out of all their hugely famous games, Siberian Storm is arguably the most popular of them all. The chilly Arctic, the wild cats, the unrecognisable yet intriguing symbols that adorn the innovative reel set up is all good and well, but most important is the fact that this is a high volatility slot that can yield (woolly) mammoth wins. Are you brave enough to face this fierce beast of a mobile slot? 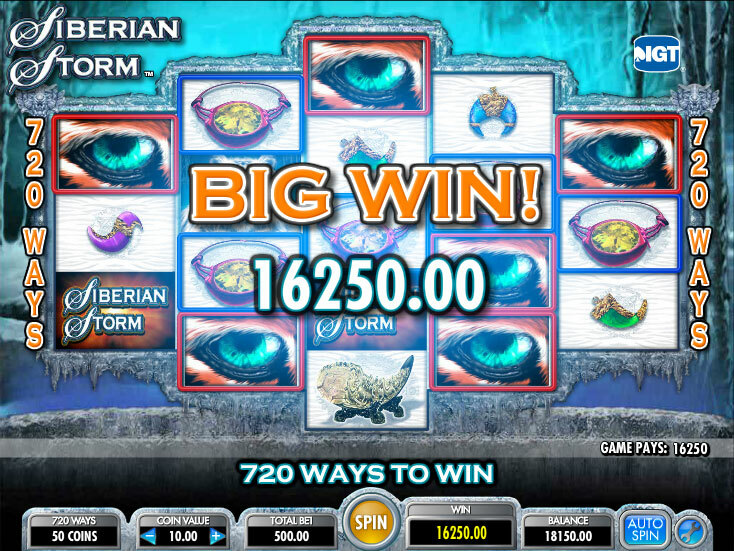 Read our Siberian Storm slot review to find out all about the 720 paylines, pay-both-way gameplay, extra spins and other features too. A land-based favourite of many, Siberian Storm has innovative gameplay and its medium/high variance means that you've got to risk big to win really big. And with IGT, the creator of slots such as Pixies of the Forest, Cleopatra, Golden Goddess, Da Vinci Diamonds and many other classic machines, you know that there will be ‘reel' innovation and generous wins in store. What's Up With Those Reels? As you may have noticed, the first thing that meets the eye with Siberian Storm isn't the peaceful wintry backdrop to the reels, but the reel set up itself. This hexagonal slot has three symbols on the outer two reels, four going inwards and the middle reel has got five symbols. You might think that's too funky for you, but the reality is that it makes the slot much more enjoyable. Unique line combos will payout and can often times catch you off guard, in a good way. If you remember a more recent release that was the aquatically magnificent IGT's Pacific Paradise, then you will be familiar to this unique reel set up. Perhaps you'll even prefer it! In addition to this, you can also win both ways with what IGT calls MultiWayXtra. You can play the Siberian Storm from as little as 50p. We say ‘as little', but we are sure you're aware that this is no small wager when you compare it to slots where you can bet 10p or even 1p per go. So, choose your bet wisely – you can go up as high as £500, but it's worth keeping in mind that this high volatility slot will not pay out often. Alright, it could be a ney for graphics too, but we have a particular soft spot for games that were first created as land-based machines and only then converted to the online and mobile slot world. IGT does a very good job at keeping the slots ‘authentic' and there are no 3D animations, HD graphic quality or beautiful musical arrangements made-to-order. If you want all that, then go ahead and play your NetEnt or your Thunderkick games. For the rest who enjoy themselves a genuine classic, Siberian Storm fits the bill. We've already mentioned the icy backdrop of this slot, which adds a tranquil atmosphere to the machine, but things can quickly get heated up because there are also plenty of tigers lurking in and about the reels. Taking about the reel animation, it's simple yet beautifully done, but then there is also one other thing. Among the Siberian Storm logos, the Arctic tigers and the simple ones, there are plenty of symbols that we cannot really put our finger on. Bizarre contortions adorned with ornate golden frames, gems that have the weird shapes…We cannot see how any of it has to do with inclement weather or tigers, but who are we to judge? As long as the slot pays, right? This Bad Kitty Can Bite! And with a return to player of 96% and its high volatility, it sure can pay! What we mean by high volatility is this: you won't get moderate wins often, but you can expect massive wins every once in a while. Which is why a strategy of moderately sized bets could be better, so we wouldn't recommend wagering £500 a pop, cause you can suddenly find yourself…broke. Yet, the other side of the coin are the massive wins that Siberian Storm can yield and with the top wager, that can truly become a spectacular sum. Let's say you're betting £500, so times that by the maximum yield of 109,210 times – no less than £54,605,000! We haven't seen a maximum payout number this high ever! Let's admit it – it's highly unlikely that you can get that top money, but a payout of say, quarter of a million, is much more common than you think. So if you're brave enough to spin the Siberian Storm reels, then you can end your gaming session considerably more rich. Do you know the saying ‘fortune favours the bold'? Get that cash out of the tiger's claws right now, or perhaps score the 50,000 coin jackpot too by triggering five Siberian symbols. Let's not keep you waiting any longer, Siberian Storm has extra spins and a very healthy amount of them. Whenever you get five eyes of the tiger [crazy dance interlude], you'll be awarded 8 extra spins. But if luck were absolutely on your side and you get more than one combination per spin, then you'll get up to an additional 96 extra spins in total. Wait – there's more! If you get five tiger eye symbols, then you are able to re-trigger the extra spins up to a total of 240, but expect less than that. Having around 16 or 24 extra spins is much more common and we'll take that any day. That's not just because the game can pay out big, but also because the wilds and the stacked wilds are much more common in Extra Spins mode. Bring on the action! As always, extra spins are nice but your real friend in Siberian Storm are the Stacked Wilds. Sure, you've got your regular Wilds, which will substitute for any other symbol to compound your winnings, but the Stacked Wilds is where the money's at. Most of the other symbols also come stacked, but when you hit a column of Wilds, then you can easily expect to strike at least 30x your bet, up to 500x your wager. No one said it will come at you thick and fast, no. You've got to sit patiently and wait for the large wins to come by because this is a high volatility slot, but when the wins do come, the Stacked Wilds really do compound them and make you rich…at least for a day. Just be careful – there is a very small step from being a self-made millionaire to losing it all with just a few spins, so wait for your winning streak and then walk away with your head held high! Although this mobile slot has got no multipliers, the MultiWayXtra feature compensates for it and then some. Not only does this mean that the game pays both ways – from left to right and vice versa – but also pays for matching symbols in any position on three, four or five of the columns. Whenever you get more than one symbol that matches on that same column, you get a multiplier. So given that a lot of the symbols already come stacked, cue Stacked Wilds, the MultiWayXtra really can bring you large wins and multipliers of 4, 6, 8 and even more. You'll never know where the generous but fair Siberian tiger will strike to award massive payouts! Want to play Siberian Storm? Siberian Storm is a highly volatile and thus hugely rewarding slot – do you dare to take a risk? 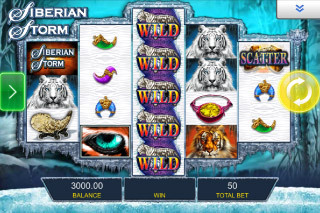 Siberian Storm What started out its life as a classic, land-based IGT slot machine in casinos around the world was converted into a mobile slot and has become one of the most popular games out there. Siberian Storm is in a league of its own, because of its high volatility: the tiger and the harsh wintry theme are dead giveaways of that. This is no penny spinner and won't award small, but satisfactory wins to keep you playing for hours. Instead, it will either take all of your bank balance and completely tarnish it with its sharp teeth and claws, or purr like a mellow little kitten when it pays out 600x your wager. And with the total maximum win of 109,210x your bet, MultiWayXtra feature wins and 720 paylines, that's more than plausible. If you have problems with your heart or blood pressure, then we'd advise to steer clear of Siberian Storm. You'll need strong nerves and a clever head on your shoulders not to lose it all in this hungry, hungry hippo IGT machine. Although there are the stacked wilds and the many extra spins that can give you a little breathing space, the rest of the time, Siberian Storm is a ruthless mobile slot. And if this slot doesn't get your adrenaline pumping fast enough, then why not try Siberian Storm's MegaJackpot version? In sum, this thrill, suspense and high-paced gameplay is exactly why Siberian Storm deserves the five out of five stars we've awarded it. Consider yourselves warned!